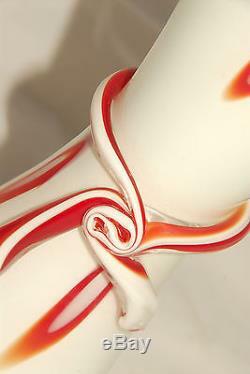 On this listing I have a RARE - MURANO - White & Red - Hand Blown Glass - Art Deco Italian TALL VASE! What a GORGEOUS & Unique piece of Art! This vase stands at 13 3/8th inches tall, and it is 5 inches wide at the base. 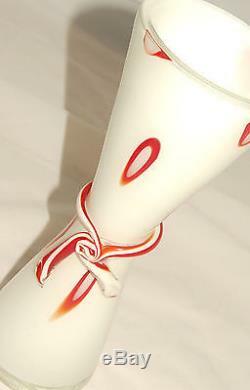 It has a predominant white color, with abstract shapes in red, as well as a ribbon tie design in the center of the vase. It reminds of the hard ribbon candy of back in the day, like my grandma would have. This vase is in perfect condition, no damage, no chips, cracks, breaks, etc... This piece will be packaged super securely, and will be fully insured. The item "MURANO White & Red Hand Blown Glass Art Deco Italian TALL VASE RARE" is in sale since Sunday, October 18, 2015. This item is in the category "Pottery & Glass\Glass\Art Glass\Italian". The seller is "qteepie" and is located in Deer Park, Texas.